Golf books come in all shapes and sizes, forms and fashions, literally and figuratively. There appears to be an unlimited number of topic and angles. The subject matter may get stretched at times, but that is one of the more endearing aspects of golf journalism. The genre has an endless range. So, when I saw Catherine Lewis’ new volume, Don’t Ask What I Shot: How Eisenhower’s Love of Golf Helped Shape 1950's America, I was not quite sure what to expect, at least from the golf perspective. Lewis is an associate professor of history at Kennesaw State University and also a curator at the Atlanta History Center. But she also has a bit of a golf journalism background with the previous publication of Bobby Jones and the Quest for the Grand Slam. I must admit, while about one-third of the way through the book, I thought perhaps this should be a history volume with the world golf thrown in a few times. But as I progressed, I realized this is a golf history book also. Lewis has produced a volume that can be used as a college text and also provides scholarly insight concerning the influence that golf had on the American society in the 1950’s. Using Ike’s love of golf Lewis presents to us his approach to the presidency which at times, according to his critics, had misguided priorities. You’ll learn to love Ike for his ability to relax in the midst of the most stressful job on earth and to despise him for his apparent disregard of his responsibilities. (He played more than 800 rounds of golf during his two terms in office.) But most of all you’ll get a great appreciation for how Ike helped to generate the golf boom in the U.S. In the end Lewis gives us an interesting historical perspective on Eisenhower’s presidency. This is not a golf history book, but rather a book that demonstrates how golf has influenced history. 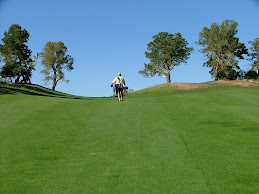 Baby Boomers who grew up and discovered golf in this period should find Don’t Ask What I Shot a most fascinating read. Golfers in general should read this to explore how golf became so popular in the United States.